We’d love your help. 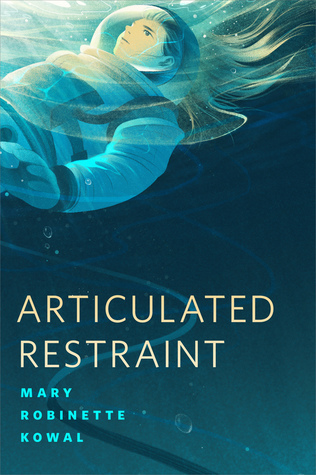 Let us know what’s wrong with this preview of Articulated Restraint by Mary Robinette Kowal. Being a Lady Astronaut means being twice as dedicated, and twice as good as everyone else. And sometimes, handling a test run that has turned deadly serious. Mary Robinette Kowal visits an off-stage incident in her The Calculating Stars series. To ask other readers questions about Articulated Restraint, please sign up. A deleted scene from The Calculating Stars that's well worth reading. In spite of pain, in defiance of Proper Procedure, Lady Astronaut Ruby Donaldson works her hardest to save the life of her trapped and desperate friend Myrtle Lindholm. Author Kowal understands stakes and investment in characters. If you've been chary of committing time to reading these books, try this short piece. If you're not gripped, maybe they're not right for you. But I'm confident most of y'all will be gripped. This is a short story set in the author's The Lady Astronaut universe. It's about the incident with the Lunetta that we know about from the novels. Only this time we get Ruby's perspective as she, Eugene and the team try to find a way to save the people trapped before anyone dies. Thus, we get to experience a test run in one of NASA's impressive test pools and look over the astronauts' shoulders as they work in the water, simulating a space walk. As I always loved anything about space and stations This is a short story set in the author's The Lady Astronaut universe. It's about the incident with the Lunetta that we know about from the novels. Only this time we get Ruby's perspective as she, Eugene and the team try to find a way to save the people trapped before anyone dies. As I always loved anything about space and stations or rockets and the corresponding science and tech, this was really cool. However, the author once again managed to combine it with a very personal story of one of the Lady Astronauts. Nothing groundbreaking but very nice to read. Only one (minor) complaint: the saying isn't "slow is fast" but "slow is smooth, smooth is fast". Nice, despite a staggering, incomprehensible gaggle of space talk. Fairly simple and straight forward story. Don‘t expect any complex plotting. It’s hard when your first experience with an author is a ten/fifteen minute short story leaves you ugly crying. I expect a lot from her and I expected a lot from this story. I was happy to get another view point then Elma’s, but the story itself just wasn’t there. I think Ruby felt a little more human, a little more flawed, as a character but the story she was given didn’t really shine. Ruby was out dancing and sprained her ankle. Then she goes to work as a Lady Astronaut the next day and finds it It’s hard when your first experience with an author is a ten/fifteen minute short story leaves you ugly crying. I expect a lot from her and I expected a lot from this story. Ruby was out dancing and sprained her ankle. Then she goes to work as a Lady Astronaut the next day and finds it she has a rescue mission to undertake with Eugene, to save his wife Myrtle who’s stuck in Orbit (I think- and yay for Myrtle and Eugene who are awesome!). So we witness her work through the pain as she tries to figure out in the test pool how they can save Myrtle and the other astronauts onboard. It was a lot of science and technical jargon and just not much else? It wasn’t boring, I enjoyed it, but it didn’t stand out in anyway and didn’t add a whole lot to The Lady Astronaut of Mars saga. A short that focuses on the determination it takes to push through pain, especially when it's self-inflicted. The descriptions of the injury, while not graphic, were well-executed enough for me to wince and hiss several times. Nice retro piece of SF Space Race nostalgia. The description of getting into, and out of, a Ye Olde spacesuit is surprisingly nerve-wracking. So much for the Star Trek onesies. Excellent. I want more. Good thing I have the two books this is related to! 5, shiny spaceship, stars! Historia corta ambientada en el universo ucrónico de Lady Astronaut. Aunque se puede leer de forma independiente, yo no lo recomiendo, pues la resolución de la historia se da en «The Fated Sky». Por otra parte, el relato es bastante técnico y tiene poca sustancia narrativa, pero la protagonista es un personaje secundario de la segunda novela de Kowal, así que si lo has leído, la conexión es mayor. Really good entry in the LADY ASTRONAUT series, of which I've only read a few stories (haven't gotten to the novels yet). Kowal does a great job of making her characters' internal lives clearly expressed to the reader, especially when it comes to Ruby's regret and determination. A nail-biter of a short story. The focus is all on one woman's "astronette" abilities to solve a deep orbit recovery mission of astronauts in distress. A taut, tension filled glimpse into Kowal's space opera. This is less a short story (or even a novelette as the author calls it) and more like a scene that didn't make it into The Fated Sky. There's nothing objectively bad about this other than the fact that so far every book in this series seems to be fighting between is it a novel or is it a vehicle to show off how much research Kowal has done. For a story that Goodreads says is only 32 pages, all of the "action" is the main character trying to get a clip hooked onto a rod. What a snooze. Compared to the masterful Lady Astronaut novels, this short is merely very good. Read The Calculating Stars and The Fated Sky first. I don't remember the scene in the full-length books that this is based off of. I don't think it matters other than context. Yes, a whole lot of nothing happens here, but that's realistic. A lot of nothing happens often in life. I see it more as a character study of Ruby and how she reacts in a particular situation. A short story in the Lady Astronaut series, taking place before the first two books. Short and sweet, featuring a character who appears in the Fated Sky. A bit heavy on the "work the problem" technobabble that drags in places in The Lady Astronaut and The Martian, unfortunately. Nice to get a view of the Lady Astronaut universe from the viewpoint of a different character, in this case, Ruby, who is caught between the superhuman expectations put on astronauts (particularly women) and acknowledging her limits. I wouldn't mind a few more of these! There is nothing really wrong with Articulated Restraint. The writing is good, Kowal has, once again, done amazing research on how things are supposed to work in her universe, and the main character is cool. But this felt more like a deleted scene and less like a short story. Maybe it is because the story is part of a larger universe, but there were all sorts of issues with this story. I wouldn't suggest it unless you've read the other stories. Happy to have a Ruby story and a little more insight into this character. Even without the reference, a great read. A good short story to supplement her Lady Astronaut series! More a scene than a full story, this takes familiar characters and has them working heroically when trying to problem-solve a life and death issue for their friends and family. It was nice to see things from a different point of view, but comparatively little story. A Lady Astronaut story. Not my cup of tea as it is too techie and full of technical detail etc. What I would call an Analog story. Also whilst interesting it is a flimsy story. the cover was beautiful as was the imagery. the author must have done a lot of research, you'll feel like you're there. Suffering and a bunch of technical maneuvers I didn't care about. Sorry, I skimmed through this one. After reading all the Lady Astronaut's novels, I was thrilled to discover that there was another short story set in the same universe. It is a good story, with a strong scientific foundation, but it is not on the same league of the previous installment of the series. Articulated Restraint is the story of Ruby Donaldson, one of the astronaut stationed on the Neutral Buoyancy Lab, recovering from a severely sprained ankle. She is not mentioning her injure to anyone for fear to be labelled as winy a After reading all the Lady Astronaut's novels, I was thrilled to discover that there was another short story set in the same universe. It is a good story, with a strong scientific foundation, but it is not on the same league of the previous installment of the series. Mary Robinette Kowal was the 2008 recipient of the Campbell Award for Best New Writer and her short story "For Want of a Nail" won the 2011 Hugo. Her stories have appeared in Strange Horizons, Asimov’s, and several Year's Best anthologies. She is the author of Shades of Milk and Honey and Glamour in Glass (Tor 2012). Mary, a professional puppeteer and voice actor, has performed for LazyTown (CB Mary Robinette Kowal was the 2008 recipient of the Campbell Award for Best New Writer and her short story "For Want of a Nail" won the 2011 Hugo. Her stories have appeared in Strange Horizons, Asimov’s, and several Year's Best anthologies. She is the author of Shades of Milk and Honey and Glamour in Glass (Tor 2012). Mary, a professional puppeteer and voice actor, has performed for LazyTown (CBS), the Center for Puppetry Arts, Jim Henson Pictures and founded Other Hand Productions. Her designs have garnered two UNIMA-USA Citations of Excellence, the highest award an American puppeteer can achieve. She also records fiction for authors such as Kage Baker, Cory Doctorow and John Scalzi.